We love the bold stripes on this pretty dress! 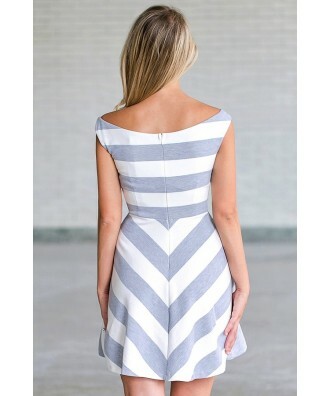 The Go Bold Striped Grey/White Dress is lined at bust only. It has a boat neckline and fit and flare cut. The dress is made of a lightweight stretch fabric. It features white and grey stripes throughout the dress. A hidden back zipper completes the dress. This dress is so cute for so many occasions! Wear this paired with sandals or wedges. Details: Lined at bust. Hidden back zipper. 95% polyester, 5% spandex. Lining: 100% polyester. Hand wash cold. Do not bleach. Do not iron. Small measurements: Length from top of neckline to hemline: 29”. Bust: 32”. You have added Go Bold Striped Grey/White Dress into Wishlist. You have added Go Bold Striped Grey/White Dress for Stock Notification. You have set Go Bold Striped Grey/White Dress as a loved product. You have removed Go Bold Striped Grey/White Dress as a loved product.